In a nutshell, the research supports the claim that low volatility and low beta stocks in the United States and across the globe outperform high volatility and high beta stocks, with low volatility stocks generating substantially higher risk-adjusted returns. Not coincidentally, the groundswell of research pointing to outperformance by low volatility stocks has created a land rush for low volatility ETPs in the first generation of “smart beta” or factor-based investment products in ETP wrappers. Since I believe smart beta or factor-based ETPs is one of the key revolutionary ideas to appear in the investment world in recent memory, I will have a great deal to say about this subject and the many tangential ideas that arise from it going forward. After nine years focusing primarily on the VIX, volatility and related subjects, it is time to charge off in some new directions, starting with some that have a whiff of volatility and ETP innovation. For now I am going to be content with updating a February 2013 post, with the title The Options and Volatility ETPs Landscape. At that time, I wanted to capture those ETPs which employed a buy-write / covered call approach, employed a put-write strategy, focused on the convertible bond space or targeted low volatility stocks. Well, a lot has changed in the past three years, notably in the low volatility space. 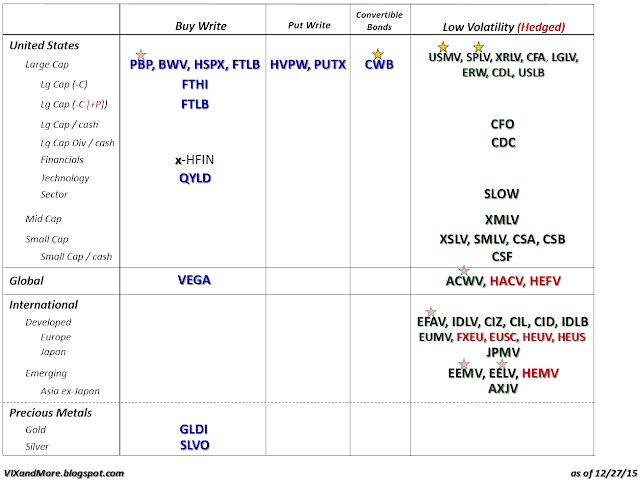 This time around, I have some enhancements to the options and volatility ETPs graphic. As is the case with The Current VIX ETP Landscape, I have added yellow stars for those ETPs with an average daily volume of 1,000,000 or higher and pink stars for ETPs with an average daily volume between 100,000 and 1,000,000. Additionally, I have highlighted the new currency-hedged crop of low volatility ETPs by using a red font and have captured the demise of HFIN, a financials buy-write ETF that closed in March 2015 with a X-HFIN designation. There are a number of other sub-categorizations I will delve into at a future data, but note that whereas FTHI is a buy-write only, FTLB adds an out-of-the-money put. Three other relatively new arrivals, CFO, CDC and CSF, are structured so that they will hold up to 75% of portfolio assets in cash in adverse market conditions. Another intriguing new entrant, SLOW, attempts to avoid sector bias by forcing greater sector diversification than most other low volatility ETPs. So if you found 2015 volatility to be daunting and are looking to dampen volatility in your portfolio in 2016 or tap into the performance benefits of the low volatility anomaly, keep the list above in mind. While comprehensive and including many ETPs with marginal liquidity, this list may not touch upon some of the many new and illiquid products that might be flying under the radar. I have been writing about VIX ETPs since the launch of the initial duo of VXX and VXZ back in January 2009 and from 2010 onward I have been plotting all of them on a leverage/maturity grid like the one below. It is amazing how often various VIX ETP investors mentioned one of these charts when I talk to them. Even through the VIX ETP space has been relatively stable as of late, I have not updated this graphic since early 2014, so a refresh is long overdue. For those who have not been following along over the years, I have plotted every VIX-based ETP using leverage on the Y-axis and maturity on the X-axis. With the advent of what I am calling VIX strategy ETPs, I have isolated in their own box in the lower right hand corner a half dozen of these products whose characteristics do not necessarily imply a fixed point on Cartesian coordinate system. The key at the bottom highlights various salient features of each of these products. From previous incarnations, I have retained the presence of non-VIX legs (typically positions in SPX/SPY), the combination of both long and short legs, dynamic allocation of the legs and optionability. I have also shaded areas where there is high leverage/compounding risk as well as high roll yield risk. Not surprisingly, these risks converge at TVIX and UVXY, two of the more infamous VIX ETPs. Another carryover is font color, where black indicates ETFs and blue is for ETNs. This time around I have also added yellow stars for those ETPs with an average daily volume of 1,000,000 or higher and pink stars for ETPs with an average daily volume between 100,000 and 1,000,000. Note that while CVOL technically makes the cut, at today’s closing price of 0.40, any sort of meaningful reverse split to raise the price about 5 or 10 would highlight just how illiquid this issue is. In fact, only six VIX ETPs pass the one million share screen: TVIX, UVXY, VIXY, VXX, SVXY and XIV. There are three new additions to this graphic. The most notable of these are VXUP and VXDN, which were launched by AccuShares back in May. These products deserve a post (or series of posts) dedicated to some of the issues surrounding them, but the short version is that high complexity, frequent distributions and consistent tracking errors resulted in a product that investors decided was not worth their trouble. The other “new” products is, VQTS, the first ETP that tracks the SPX VEQTOR Switch Index, making it a relative of VQT and PHDG, but one which uses a dynamic allocation to VIX futures to achieve a 10% target realized (historical) volatility. VQTS was launched in December 2014 and like most VIX ETPs, has struggled to reach critical mass. 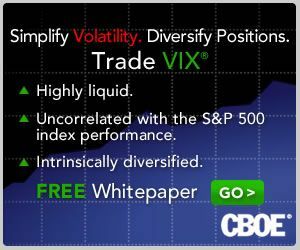 While the VIX ETP market is showing some signs of maturing, there are many new and exciting developments in terms of low volatility ETPs and more broadly in the ETP space in general. As I am currently at the IMN 20th Annual Global Indexing & ETF Conference – and scheduled to speak on a panel, “Trading the VIX: Riding Today's Waves of Volatility” with Larry McDonald, Mark Shore and Matt Moran tomorrow – this seems like a good time to devote more time to writing and in particular to resurrecting the “and More” portion of this blog. Just a quick public service announcement to remind traders of VIX futures and options that the VIX weekly futures and options, which the CBOE launched earlier this year, will expire tomorrow instead of the usual Wednesday expiration. The reason for the unusual Tuesday expiration is the Christmas holiday calendar. Keep in mind that VIX options expire 30 days before the underlying S&P 500 Index options on which they are based. As Christmas Day falls on a Friday this year, the SPX weekly options for the fourth week in December have their expiration moved up to Thursday, December 23, with the VIX weeklys for the fourth week in November moved up to tomorrow. Perhaps even more important, this means that this week’s VIX weeklys can last be traded today, so if you harbor any intentions about opening or closing a short-dated VIX weekly options (or futures) position tomorrow, be sure to make that happen today instead. As an aside, as I see it, the VIX weeklys are the most important product launch in the volatility space in several years. The VIX weekly futures were launched in July, followed by a launch of the VIX weekly options in October. How popular are these products? Well, the VIX weekly options that expire tomorrow have an open interest of just under 100,000 contracts as I type this, as the graphic below demonstrates. The VIX weeklys have already become a staple of my client portfolios and are something every volatility investor should investigate. If you are one of those who has shied away from weeklys or is not comfortable trading options close to expiration, one book that I’m sure will give you something to think about along those lines is Jeff Augen’s, Trading Options at Expiration. Note that the links above are for 2016. For 2015 or for any other year, just edit the URL accordingly. Finally, I have missed blogging on a regular basis and am committed to getting back into the game this week, ramping up my activity into the December FOMC meeting. After a hiatus of almost a year (the October 2014 pullback, to be exact), I have reprised the VIX and More Fear Poll in an attempt to get some insight into which issues have been responsible for bring fear back into the investing equation and in so triggering the highest VIX spike (53.29) outside of the 2008-09 financial crisis and the #5 and #6 one-day VIX spikes ever on consecutive days. I should note that Tuesday’s responses had “Market structural integrity (high-frequency trading, flash crashes, exchange stability, etc. )” as the #1 concern, but a late flurry of votes today for “China – weak economic growth” put China concerns over the top. Combining Chinese growth concerns with concerns about a bubble in Chinese stocks and/or housing makes it a landslide in favor of all things China. Without too much of a stretch, one could also lump in the likes of currency problems, deflation, low crude oil prices and falling commodities prices in general into a broader China-related bucket and suddenly the China + ripple effect accounts for about 50% of the votes. As always, I love to see how the American view of the world contrasts with those non-U.S. respondents. This time around, the area most overemphasized by Americans relative to the rest of the world is, in classic Americentric myopia fashion…”U.S. – weak economic growth,” which 8.7% more Americans label as their #1 concern than their non-U.S. counterparts. Conversely, the biggest blind spot for Americans – at least relative to the concerns of the rest of the world – is commodities prices, which Americans underweight by 5.1%. A close second in the American myopia sweepstakes is Chinese bubbles in stocks and/or housing. I do not find the commodities oversight to be surprising, but certainly the relatively low concern about Chinese bubbles is unexpected. For those who have not seen some of the earlier incarnations of this poll, these dataeback to 2012 and chronicle a U.S. public that was so obsessed with the fiscal cliff that they did not fully appreciate the gravity of the European sovereign debt crisis. Nary a pullback goes by without at least a handful of requests to update my pullback table to help put the current pullback in perspective. Whether the current market action is best described as a pullback, correction or even bear market, I am happy to oblige. For those who may new to this graphic, note that the table below includes only S&P 500 Index pullbacks from all-time highs and only those that go back to the March 2009 bottom. (Due to the all-time high requirement, I count back to the May 20th intraday high of 2134.72, even though almost all of the damage has been done in the past three days.) In terms of defining the minimum pullback for the table, here 2.75% seems to be a natural cutoff, but I am more apt to include smaller numbers if it took a relatively large number of days to arrive at the bottom. Of course the current move does more than just squeak in: it is now the third largest in terms of magnitude at 12.5% and second longest from peak to trough, at 66 days. Worth noting is that the #1 pullback (21.6% in 2011) saw a peak VIX of 48.00 during the decline, while the #2 pullback (17.1% in 2010) coincided with a maximum VIX of 48.20. The current pullback falls into the #3 slot, while the #4 pullback (10.9% in 2012) saw a maximum VIX of only 26.71. For the record, today’s VIX intraday high of 53.29 is the highest VIX on record outside of the 2008-2009 financial crisis, with data going back to 1990. While there is no obvious proximate cause of the current pullback and VIX spike, it is clear that concerns about slowing growth in China is the main source of investor anxiety. Investors are clearly uneasy about various sub-plots related to the real level of China’s GDP, the impact of slowing Chinese growth on commodities and related markets, speculative excess and bubbles in China’s domestic stock market (ASHR) and real estate market (TAO) or broader concerns about the ability of the Chinese government to manage the economic transition from infrastructure-driven growth to growth based on domestic consumption. Sharp selling and higher volatility has been present for many months in commodities and currencies. Only recently has the selling and higher volatility spilled over into Chinese equities and emerging markets as a whole. In fact, emerging markets have suffered greatly as of late, with the popular EEM ETF plummeting during the last two weeks and now down 32% from its April high. At the same time, the VXEEM emerging markets volatility index soared to record of 111.39 on an intraday basis today, crushing the previous all-time high of 86.44. As with all big pullbacks, at this point we only know that we are closer to a bottom and have no assurance that the current bottom will hold. Most likely it will be tested again in the next day or two and traders will take their cues based on how well SPX 1867 holds up as support. Many readers have commented that one of their favorite of my regular graphics is the table of VIX spikes of 30% or more that I update periodically in this space, along with the subsequent performance in the S&P 500 Index following these spikes. This time around I have elected to add an additional column that identifies the catalysts involved (necessarily a subjective process) in each instance. When thinking about these catalysts, it might be helpful to compare the nature of the threat and the size of the VIX spike to changes in volatility during various high-profile historical events, an analysis I captured in Volatility During Crises. Another useful exercise is to think about the fundamental factors influencing each VIX spike in the context of A Conceptual Framework for Volatility Events, which I find particularly useful in helping to gauge just how large of a VIX spike a certain type of event might trigger. Of course the table below has its own set of data nuggets, both fundamental and technical. One interesting statistic I find worth highlighting is the relatively high frequency of large VIX spikes that have occurred during the past five years. VIX data goes back 26 years and yet more than half of the VIX spikes in this table data are from the past five years. I think it is no coincidence that the VIX ETPs (initially VXX and VXZ) were launched in 2009 and the inverse VIX ETPs (XIV and ZIV) and leveraged VIX ETPs (starting with TVIX) were launched in the following year, when big VIX spikes suddenly became more common – much more so than during the 2008 financial crisis, the dotcom crash, etc. For additional information on the subject of more VIX spikes in spite of a generally lower volatility environment, check out 2014 Had Third Highest Number of 20% VIX Spikes. As noted previously, based on the data for all VIX spikes in excess of 30%, the SPX has a tendency to outperform its long-term average over the course of the 1, 3 and 5-day periods following the VIX spike. Also worth noting that that 10 and 20 days following the VIX spike, the SPX has a tendency not only to underperform, but to decline. Further, while the huge decline following 9/29/08 VIX spike tends to dwarf the other data points, even when you remove the 9/29/08 VIX spike it turns out that the SPX still loses money in the 10 and 20-day period following a VIX spike. When the analysis is extended out 50 trading days, the SPX is back to being profitable, but performing below its long-term average. On the other hand, when the analysis includes 100 days following the VIX spike, the SPX is back to outperforming its long-term average. In summary, this data suggests that following a 30% one-day VIX spike, there appears to generally be a tradable oversold condition in stocks that lasts approximately one week, followed by a period of another month or so in which the markets typically has difficulty coming to terms with the threat to stocks. This tendency makes today’s market action even more remarkable in that today was by far the worst performance of the SPX in a day following a 30% VIX spike. Taking a longer-term perspective, looking out at least one quarter, all fears are usually in the rear view mirror and stocks are likely to have tacked on significant gains. As noted many times here in the past, the data in this table supports the idea of both short-term and longer-term mean reversion, but calls into question the role of mean reversion in the 10-20 days following a VIX spike, where fundamental factors have a tendency to overwhelm a technically oversold condition in stocks. Steve Sears and I have a running joke that whenever I am tapped as a guest columnist for The Striking Price at Barron’s, we should both start buying VIX calls as inevitably something is going to come along and cause a volatility spike just in time to give me something topical to discuss. This time around I thought China might be the culprit or Greece or Puerto Rico or the Fed or maybe even the NYSE. In fact, it was a cocktail of everything that has turned a relatively quiet Q2 into a much more menacing volatility environment in Q3. In Seizing Opportunity From Stock Market Volatility, which appears today in Barron’s, I turn my attention to small caps (RUT, IWM) and use IWM vs. SPY as a way to think about relative volatility in the context of exposure to China, the euro zone and a strong dollar. Focusing on the Russell 2000 Volatility Index (RVX) and VIX, investors have been attributing roughly the same level of uncertainty and relative risk for small caps as large caps, which I see as questionable when one considers the very different exposure each asset class has to global issues and the dollar. Given that RVX futures (VU) are thinly traded, it probably does not make sense to be short VU and long VX, the VIX futures. Another way to translate the thinking above into a strict volatility trade would be to short an at-the-money straddle for RUT or IWM, while going long an at-the-money straddle for SPX or SPY. That type of trade is probably a stretch for most Barron’s readers, but I suspect is probably right in the wheelhouse of many readers in this space. For the Barron’s article, I came up with something simpler to execute, an IWM Aug 121/123 bull put spread, which has both volatility and directional components to it and is disengaged from volatility in SPX/SPY. If any of this sounds a little bit like a corollary to some of my work on “disaster imprinting” then some readers clearly have very good memories.